Our mission is to make it easier for people to sell fashion and handmade items when using smart phones, iPads, and the web; simplify sharing of selling items across social shopping, fashion, and networking sites; and create a better shopping experience across the social web. Social Ecommerce mobile and web app for fashion sellers, retailers, and shoppers. Here are the 4 cornerstones of TryMyFashion. Sell the item that you’ve put your heart and soul into creating or sell that special used something to someone else. Get it out there. Don't be afraid. Share the fashion your selling across all relevant social sites, not just the top two. Open yourself up to the right audience. Build relationships with other shoppers and sellers. Shop and find that special fashion to purchase across your favorite social site or follow and go directly to the seller's TryMyFashion store. 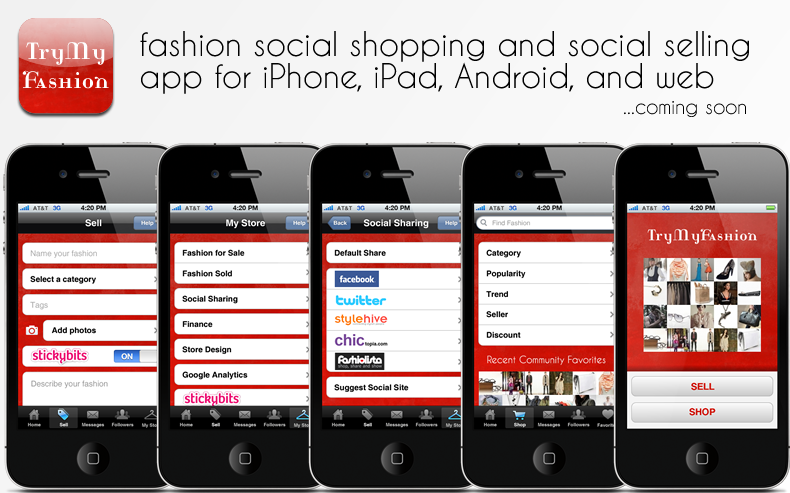 Share your favorite fashion finds and purchases across your favorite social networks and social fashion sites. Share from here, share from anywhere. Easy to Use and Available Across Multiple Devices. Quick setup and use from iPhone, iPad, Android, and the web. Simple and easy to use navigation for selling, posting, managing, and updating new items for sale. Sign up and Login with Ease. Use your Facebook or Twitter account IDs to create a TryMyFashion account. The smart phone app enables sellers to quickly take pictures and attach them to an item being sold. Personal Presence with Professional Shop Templates and Flexible Branding. No coding required. We have many professional templates available and enable uploading of custom branding and graphics. No cheesy templates here. Free To Setup and Low Selling Fee. Sell as much as you want without paying a listing fee. Also, we only charge a 3% selling fee. Connect to Multiple Social Services with Ease. When setting up your shop enter your user id / password for your social networks and select which networks you want to share your item with when posting for sale. The app will publish it across multiple services for you. That’s it. Go Beyond Facebook and Twitter. While we support sharing selling items and posts with Facebook and Twitter, we also support sharing items across social shops and networks focused on fashion. Interactive Reviews with Digital Barcode. Optional digital Stickybits barcode can be attached to each item enabling shoppers and buyers to use Smartphones to attach reviews and interactive content to your item anywhere it is shared. Shoppers can socially recommend an item from the seller's page, leave comments, or share from its social landing page. Create a fashion favorites list and share it with friends and followers. TryMyFashion is led by Patrick Phelan. 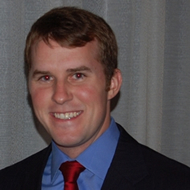 Patrick’s experience includes providing interactive marketing services and development for clients such as Macy’s, Bloomingdale’s, HP, Acxiom, Terminix, Holiday Inn, and Yellow Tail Wines; and teaming with organizations such as Digitas, MTV, and IBM on interactive advertising campaign solutions. TryMyFashion is actively seeking an angel investment partner / advisor to grow with and is seeking help in finding the right leadership team to grow with us at a co-founder level. Interested in signing up for a private beta invite? Enter your email address and we’ll add you to our list for beta invites. Once the app is available for private use and testing, we will email you a link to download the app for your device and a link to access the website. You are welcome to contact Patrick directly via email for all inquiries related to working with, partnering with, or investing in TryMyFashion. ©2010 TryMyFashion. All rights reserved.